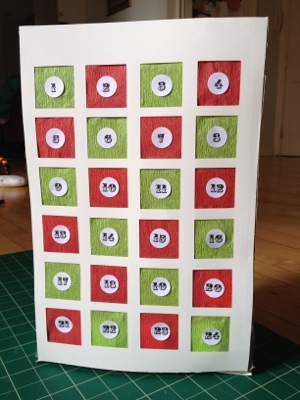 The kids had so much fun with the Candy Button Punch Box I made a couple years ago, that I thought I’d use the same concept for something else–a mini punch box advent calendar. I went with squares this time (thanks for the idea in our comment section, Heidi!) and shrank it down to 9×12. 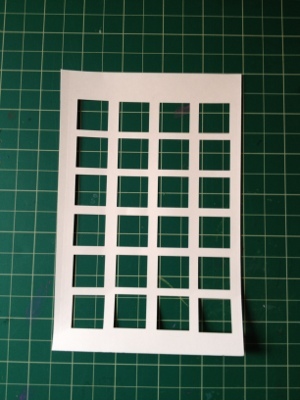 I cut out the front using my Silhouette, but it can be done just as easily with a ruler and Exacto. 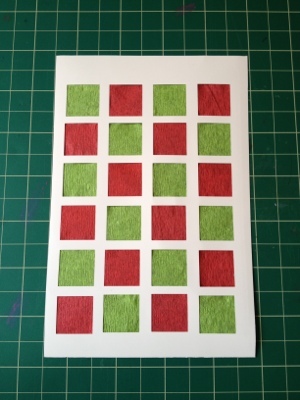 My squares were 1.5″ x 1.5″ and I could fit four across and six down. I went with 9×12 so that it would fit into a gift box. 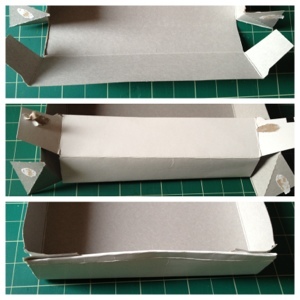 If you’re going the Exacto route, use the lid of the gift box to save yourself the trouble of attaching the the front. Just glue on the tissue paper squares. I tried crepe paper for texture this time around. To hold the little treats, I used bathroom cups and hot glue. You could also cut around the rim to make tabs and tape those down.Then put the gift box over the cups and flip the whole thing over. If the gift box is a little bigger, a few cuts and folds will get it to fit. Then I taped the the edges from the underside an kept it simple, but you could tape around the edges on top with some festive washi tape. Or punch out snowflakes or holly to decorate around the the box. I printed out the number stickers on 1/4″ circle labels.